On a very late Sunday night, after a couple of months of preparations our DXpedition journey finally begins, with my daughter and son in law driving me to Riga for plane to catch next morning. Our car is completely loaded with bags and equipment leaving space for just the three of us. 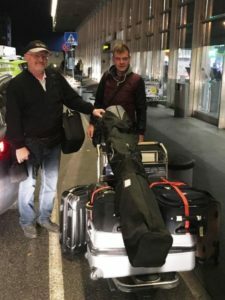 Around 6 o’clock I meet with Kaspars near Riga international airport, we quickly rearrange our luggage and go for the check‑in to our flight to SSG (Malabo), booked via Paris and almost 13 hours of flight to our destination. Standard luggage limitation for this flight is two bags of 23kg per passenger and a hand luggage. Our entire luggage exceeds those limitations and weights 134 kg in total and the antenna bag is oversized. Riga Airport Security carries out detailed check for one of our bags and requests more information on the contents and their purpose. After explaining everything is good, we have to pay 75eur for extra weight and we can proceed. In each of our hand luggage, we have packed a PA, K3 and a laptop. The flight to Paris with the transfer to Airbus A330 goes by very fast. Flight from Paris to Malabo is fully booked and there is scheduled one in-between landing in Cameroon, were most of the passengers disembark and from there to Malabo we are only 10-15 passengers on the plane. When we arrive at our destination, an unpleasant surprise awaits us – one of our check-in luggage is missing. As a coincidence or not – it is the same bag that was checked by Airport security while checking-in, maybe they forgot to load it afterwards or it was caught up somewhere in the middle. Message from Airport employees in Malabo regarding when we could expect our things back is very unclear – tomorrow, after tomorrow or maybe even next week. Transport that we booked to take us to our hotel “Mango suites” was already waiting for us outside. After arriving we have a chat with the Senior Manager from our hotel and he tells us that 3C7A (LA7GIA) has also been here and operated from the very same hotel. Next day we took some time to look for possible antenna set-up places around the hotel and we realized that it was not very suitable. The roof was slanting and unfit for that. Next to our hotel was an embassy and other surrounding areas were populated too, with no parks or gardens nearby. 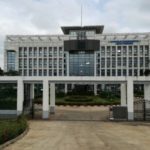 In the morning, our hotel Senior Manager kindly helps us to find English-speaking taxi driver and we drive to the Ministry of Communicates and New technologies. This is a very new Ministry and nobody there really understands what we want and are looking for, so we went straight to the Director of Telecommunicates department. During our conversation, he tells us to prepare official application and detailed description of our hardware and equipment (including serial numbers), and the necessary frequencies that we want to use. We complete the application in one hour and we are back with all other necessary documents a bit later around 2pm, however, director is gone and we are told by the secretary to come back tomorrow at 10am. We move to another hotel that is more suitable for our operations and currently it is the best we have seen so far. Our friend Ferming, English-speaking taxi driver, is ready to help and assist us twice a day during our whole stay. Therefore, we keep driving around the city to search for the perfect place for our operations. In the afternoon, we set up GP antenna and walk to the city to have a dinner and to look around. Shortly we receive phone call from our hotel Manager regarding our antennas and he asks who allowed us setting them up. We arrive back to the hotel around 8pm and several cars with representatives of different security services wait for us there. We humbly explained that we did not know that the rules are so strict and to solve this misunderstanding and to show our true and sincere intentions we immediately took down all the cables and antenna. At 10am, we go to the Ministry to meet with the Director. This time we get some progress and information about approximate costs for the operation licenses. Firstly, I asked for a yearly license, but the price of that I better do not say aloud. Then we agreed on a monthly license, which ones price was also quite impressive. Anyway, we pay money and wait to receive the papers. Director is promising that they will be ready in the evening or next morning. This makes us a bit sad, because we realize that tomorrow is Saturday. I even make a joke that I am not leaving the office and staying overnight if it’s necessary to get the licenses. At this point, we do not have any other options than just to wait. Soon the first week of our trip will be over, but we still have not obtained the licenses. In the meantime, we search for options on how to get to Annabon. We find out that for this week all flights have been cancelled and the next possible flights could be only on Tuesday or Saturday. Again, we have no other choice than to wait and hope. We also have to consider that not only getting to Annabon could be difficult, but getting back as well. In the morning, I call Director and he informs me that the Minister has signed our licenses and now they are on the way to us from Bata. The best-case scenario we will get them on Monday. We have some time so we continue to look around for a hotel that would be more suitable for our operations. Next closest city is Luba, 50km from the Ocean. Bus service takes us right to a very beautiful hotel called “Nautico” that is located on the very shore of Ocean. After having lunch we try to find someone from the hotel Administration and we express our wishes. We look around the territory. Unfortunately, the only available free field is on the shore of Ocean, but in few hours, it will be under water by the tide. The roof is not very suitable for installing the antennas because of the sloped tin roof. Administrator of the hotel is very responsive and ready to support our activities, but we have to decline this option. We ask for information, locals show us directions and we walk towards next hotel “Trokadero” to search for more suitable places. After an hour of walking, we realize that we did not ask how far the hotel was and we decide to turn around. We catch a taxi and the driver tells us that it is 9km away from the city and he drives us there. During the way he shows us couple more hotels, unfortunately none of them fits our requirements, either the territory is very limited or there is no garden, park or field where to set up the antennas. In general, there is no processed land or planted gardens around houses, only a fence and a jungle or another neighbor’s house. In the evening, we call Director again and he informs us that the licenses have arrived and that all that is necessary is to put on some stamps. We agree on a meeting in his office on Monday 10am. With high hopes, we return to our hotel in Malabo and wait for Monday morning. 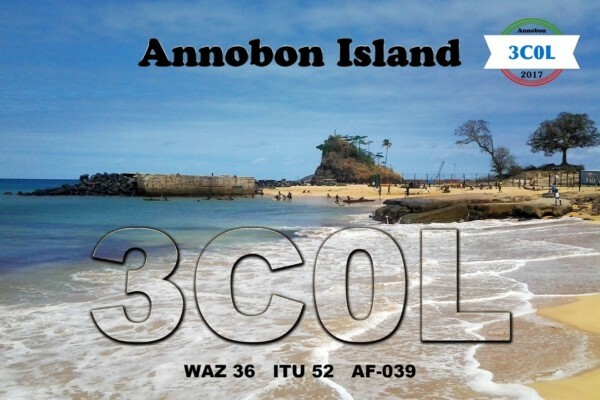 In the morning we go to the Ministry for our licenses, director awaits us there with a letter and our callsigns – 3C0L for Annobon and 3C1L for Malabo. Formalities take about 2 hours and the result is successful. We also made a good friend in the Ministry who is willing to help us in future who can we call in case we will run into problems. We take a couple of pictures while saying good-bye and leave. Our friend Ferming reminds us that we still have to inform the local police about our operations before we start to work. In the police HQ we visit multiple offices with our case and nobody is willing to give accept. I insist that we have to solve this today and we cannot wait for additional written approvals from the Ministry, my persistence gives results and we visit the Secretary Cabinet, where our papers are approved and the permission to operate is granted. Then we go back to hotel to show approved papers to the hotel owner and start setting up antennas. He is not there and through phone call, he promises to come by in couple of hours. He gets here around 8pm and during our conversation starts to ask specific questions – what benefits he will have! We realize that we won’t be able to set up antennas on the roof tonight so we decide to continue this conversation in the morning. For now, we are able only to set up our GP near hotel. 3C1L makes first QSO with ND9G on 17m. Until midday, we manage to make around 1500 QSO. 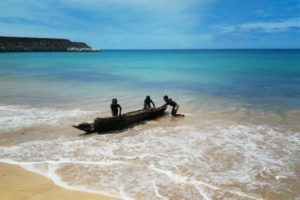 We receive a call from our friend Jonny (our taxi drivers Ferming`s relative) and he tells us that it’s possible to buy tickets for flights to Annobon. In twenty minutes time we take down GP antenna, pack our bags and drive to the airport, however, due to bad weather conditions the flight is delayed until next morning. Anyway, the good news is that we have our tickets on hands and we hope to get to 3C0 tomorrow. At 7am we meet with Jonny and drive to the airport. Weather conditions do not look promising and it rains without stopping. We wait in airport until 12am when finally they start to accept the luggage and give out tickets for a special flight. Before the flight, Jonny introduces us to Alida, who will be our guide in Annobon. After one-hour flight, we are in Annobon airport and police takes away our passports. Aida brings us to the police station and explains to an officer who we are, but the passports are not returned yet and we are invited to meet with the Governor of Annobon on Monday. During the rest of the week, here is national holiday – Independence Day. In the meantime, we keep looking for QTH. Taxi driver brings us to look at a house for a rent. Everything would be good, except there is no place for 160‑30 vertical antenna. We look at another place but the same problem. In the evening at our current house, we check the grid voltage and it fluctuates intensively so it’s not very promising. Tomorrow at 6:30am we plan to attend local holiday manifestation. Together with locals we participate in the Independence Day manifestation and during the parade we receive good news from the governor’s office that he will meet with us on Friday. We are looking forward to this meeting because we cannot operate without his approval. Later that day we keep looking for better QTH options, but we can`t find any better choices than the one we already have. We also keep looking to rent a generator for daytime operations, when the electricity is turned off from 6am until 6pm. This is the 10th day of our expedition since we have been in Equatorial Guinea and I think we have managed to do a lot given all the circumstances – we received licenses, we got to Annobon, we have moved into a house. Could we have done more? I don’t think so because this is Africa. The good news is that we have some good friends who are helping us. 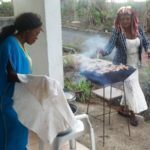 In addition, today is Kaspars birthday and our local friends greet him with celebratory lunch – grilled Annobon fish and side dishes. Meeting with governor is postponed to Monday, however, we get the permission to start operate.Right away we set up 160/30 RA6LBS antenna. In spite of all cloudy and rainy weather conditions we had before, the sky today is clear without a single cloud and the sun is frying us like a hot pan, the only saver from heat is a little wind breeze and sheltering in shadow. After couple of hours, we complete vertical with radials. It’s located ~100m away from our shack, because it was the closest best suitable place we could find. With this little time in sun it was enough to get sunburned, especially the skin on our legs. The next antenna we complete is Folding antenna just across the street. On top of the electricity shortage during the day we also lose water supply and we don’t have shower. At least we had some bottled water for drinking. At 4pm our local friend brings us 2.5kW generator. 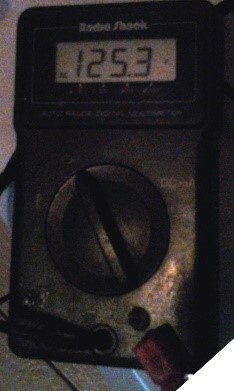 We test it and it can’t even handle one PA on 500W, so for now during daytime we operate only with transceiver 100W. 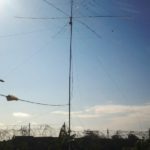 First QSO is made with DL5LYM on 14Mc CW. In the evening we are visited by one “friend” who tells us that it is his land and asks for a payment otherwise we will have to take down our antennas. He asks 200$ for 2 weeks. Our local friends participate in this discussion but we cannot find common grounds and we leave the discussion for the next day. During the night we manage to work first 14 MC, pile up is very good. During the day we operate on 15m with 100W. Around midday, the landowner shows up again and this time he is more reasonable and asks for 100$, with some bargaining we agree on 90$ and this problem gets resolved. Now we can continue to wire cables and tune our antennas. After midnight we switch to 80m and test SWR=3. We tune Expert antenna and it works, but something is wrong. We go check the antenna and it appears that someone has turned off power supply for command box and the antenna is operating on its default 160m. We turn it back on and tune the antenna after which it works much better. During the night we make 750 QSOs on 80m. 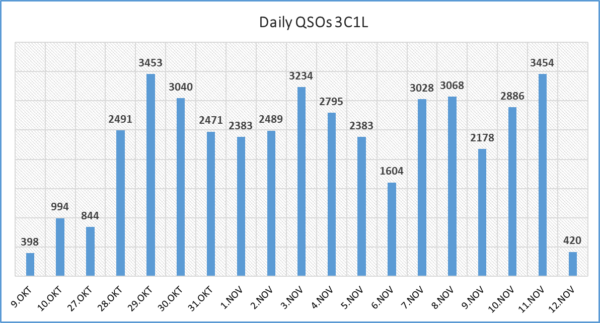 In the morning, when the electricity is turned off, we have made around 4000 QSOs in total. During the day we use generator and operate with 100W on 20 and 15m. After midday we set up GP 30/20/15 and work a little bit on 30m. Local angler comes by and offers us to buy some fresh caught fish and we turn him down by telling to sell the fish to our local friend and helper Alida, who cooks food for us. Day starts with bad news, because after midnight one of transceivers stops transmitting. I consult with friends and we cannot find the problem, so I call my wife home and ask her to bring my other transceiver to Girt YL2KL so he can send it to Malabo via DHL. In best case scenario it will get to Malabo on October 24th. Police chief gives us back our passports. After that we are on the way to meet with the Governor and we are accompanied by our friends Alida and Eduard. We tell the governor about amateur radio and our expedition. 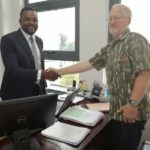 We also tell him about humanitarian aid program “Hams with Hearts” that is funded by radio amateur community and our plans to visit local school to give presents to pupils and first need aids to the school. 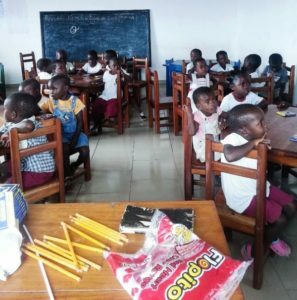 Our friends Alida and Eduard will help us to carry out this mission by buying school things in Malabo and bringing them back to Annabon, because on the island there is little options and low supply on these things. Governor also invites us to come back to island in a year or two when the electricity supply upgrades will be completed and living conditions will be improved. In addition, there on the island is new hotel being build that should be completed in 7 months’ time. Sadly, he refuses to take pictures with us because it isn’t allowed for politicians there. Back at our shack and more bad news. Unsuccessful generator start results in voltage fluctuations and leads to burned transceiver power supply. We are left only with one set of equipment. These problems will be a huge lesson for our future expeditions. During the night we continue to work on 40m and make around 1300 QSOs. 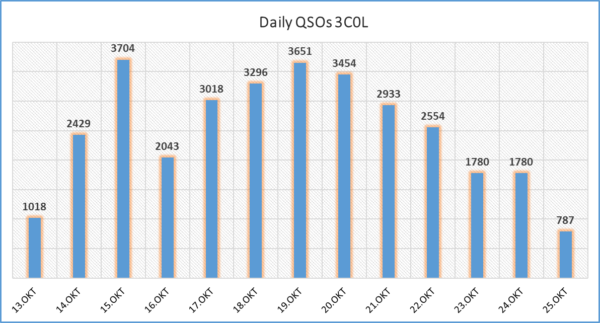 Total 8500+ QSOs are made after 3 days of operation. Flights from the island are not regular and the next flight is also canceled. First it was told that the flight will be on October 21st and in that case we would have stopped to operate on October 20th. Today we were told that next closest flight could be only on October 24th. From one point of view this is good and we can operate from Annobon for 3 more days, however from other point we lose our plane tickets home that are booked on 24th of October and we will have to buy new tickets and doing it so late will cost a fortune. Until this day we have managed to make 17000+ QSOs. Today we also started to operate on 12m and managed ~800 QSOs and a little bit on 10m. Our days have found its rhythm and routine. During the night, while electricity is available we operate with 1kW PA and from 6am till 6pm we turn on generator and operate with 100W that are maximum our generator can handle. As usual, after midday Aida visits us with prepared delicious meals, most of the time its cooked chicken or fish with dressings and side dishes. Fish is major food supply for people living here on the island. Tomorrow I will go and take pictures of sunrise and the local anglers going in to the ocean. I also will collect some sand for our Italian friend Castellani and his sand collection, which consists of more than 3000 sand samples from all around the world. I have brought him some samples from Iran, Bangladesh and now it will be from Annobon and Bioko as well. Very early in the morning Eduard and Alida gives us a tour to see significant places on the island. One of them includes the island mountain – an old volcanic crater with freshwater lake in the middle, which is the main water supply for the island. It is surrounded by subtropical forests and for some time there has not been any rains and the water level in the lake has decreased, which is the reason of some water supply shortages we had. To get there we had to hike for an hour and it was challenging, but worth it. After that, we continued to the mountaintop and during our hike we ate some delicious natural mango fruit that were fallen from trees growing on the path side. With the sunrise we reached the mountaintop and the scene from there was amazing. We took some pictures and spent there all day. In the evening we went back and we reach the village when it was already dark. We were very tired after the hike but it was worth it. After a good nights rest we await Monday with hopes to get some news about our flights, but as usual, we get the answer – maybe tomorrow, maybe after tomorrow or maybe on weekend. I also had to see a doctor to check my ear, because I lost hearing with one ear. After some cleaning procedures, it was all ok again. 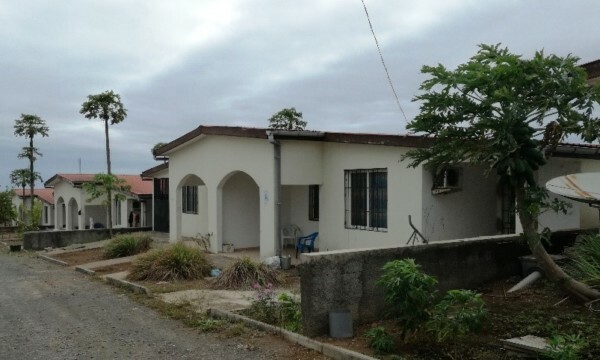 There is a new hospital built on the island, but its not operational because of electricity shortage so for now they are staying in the old one until the electricity upgrades will be completed. During the day we had some connectivity issues with the transceiver and computer, but after some time we manage to fix the problem. In the evening we get some good news, the water supply has finally reappeared and it is possible to take some nice hot shower. Twenty minutes after electricity switch on there are some major problems with the grid, voltage fluctuates from 0 – 250V all night and with these kind of fluctuations we cannot use our equipment. Let me remind you that on the island the power is available only from 6pm till 6am. During that time we use our PA and work with 800W and all other time we use one noisy generator that can supply only 1 transceiver to operate with 100W. We take down 18m vertical and during the day we operate with Folding antenna hexbeam and vertical on 30/20/15m. In the evening, our friend Eduard takes back his generator. It was very old and noisy but it was our only option and thanks to Eduard who gave it to us without asking anything in return. 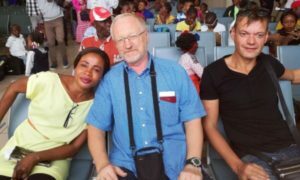 We pay a visit to the local school within the “Hams with hearts” program and after that Eduard takes us to see Annobon`s most beautiful white sand beach called “Love beach”, which actually was quite close to us all the time but we did not manage to go for a swim there even once. 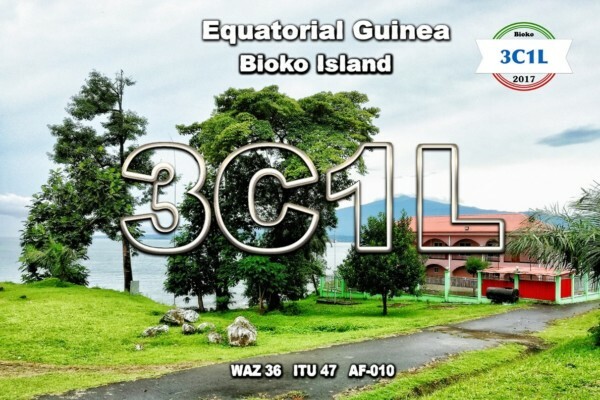 After that, we go back to our QTH and start to take down Folding antenna when we receive a call from Eduard and he says that we have one hour till our plane back Malabo. In a rush, we pack our equipment and antennas and while doing that we already see a plane landing on the island. Alida with friends takes us to the airport where we see people gathering and waiting to board the plane. 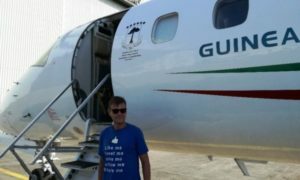 It turns out that president of Equatorial Guinea has sent his plane to the island because the Ceiba flight company is having some problems with planes. We were very pleased to fly on a presidential airplane. We land in Malabo airport next to some plane hangars that are approximately 2km away from main airport and it has no transport available to carry us with our 100kg baggage to the arrivals. Our friend Jonny meets us in the airport and takes us to our hotel. All day goes by with unsuccessful QTH position search and additional transceiver DHL shipment customs. State officials want significant amounts of money in custom “taxes”. Like always, no responsible persons or officials with whom we have to speak are here and we are told to come back tomorrow. Saturday is Election Day and everyone is preparing for it. This is the 2nd holiday that affects our plans. First thing in the morning, we go to solve our problem with the customs and it is unsuccessful again. After that, we move to other hotel that is located 50km away from Malabo to start operate with at least one station. We found this hotel before and it was the best option for QTH. It is located near ocean coast with local electricity supply 36kW generators so electricity should not be a problem. Until dusk, we manage to set up Folding antenna and working station. In the meantime, hotel administrator talks on phone with hotel owner to consult and finally our papers with the letter signed by the Minister are accepted and the green light is given to start operate. During the night, we make around 3000 QSOs. In the morning hotel owner comes and visits us, he is very friendly and helpful towards our project. We tell him about amateur radio and demonstrate how we operate. Afterwards, we set up vertical RA6LBS, the only problem is the little space available, but we manage to do it next to costal slope and squeeze it in between the trees. After 2nd operating day we have around 6000 QSOs. 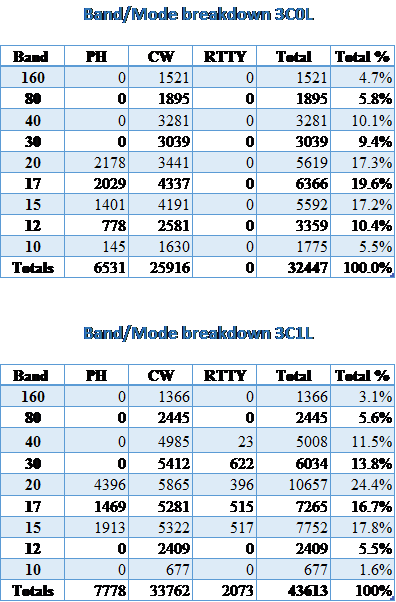 Currently we are working only with one station and we are trying to resolve the custom problems for second transceiver. In the morning I go to Malabo to deal with customs issues and to get our 2nd transceiver. Nothing goes as planned, usually the customs chief is out of office and I`m being told to come back tomorrow. This continues for four days and in “taxes” I have already paid close to new transceivers full value. In the end, customs security representative tells me it’s forbidden to bring transmitting devices in to the country without special permits from the state. I guess it would have been easier just to send the transceiver back to home, however, with so much energy and money spent on this I tried one more last option, to ask Communication departments’ Director for help. He is the man who helped us get operating licenses. I visited him next morning and told about our problems and after 3 hours transceiver was in my hands and I was on my way back to hotel. Next couple of days we spend in real resort, starting every day with a swim in the ocean, breakfast and dinner in restaurant, and most important – operating in the air with both stations. Rest of the days goes by fast and the time has come to think on how to get home. Previously bought flight tickets on October 23rd are lost and we have to buy new ones – on Monday, November 13th. Last QSO at 05:01 with F8BUO. During the day we pack our bags, take down antennas and we wait for taxi that was ordered to pick us up on 6pm. Two hours go by and no taxi shows up. We call the taxi company and they inform us that all taxi orders have been cancelled and they will not drive because of the elections on Sunday. We look for other options and around 10pm we find a restaurant visitor who is willing to help and take us to Malabo. Our flight to Madrid that was scheduled on 6am is delayed because the airport is still closed after Sunday elections. We spend one more day in hotel at Malabo and fly home on Tuesday morning. During 3C0L/3C1L expedition for “Hams with hearts” program we raised 817€ in total and spent 309€. Left over 508€ will be used for “Hams with hearts” program in our next expedition. On Annobon we managed to visit school only on 25th of October, which was one of the last days on the island and this visit had to be accepted by the school principal. Because of irregular flights to mainland, it was not possible to buy all the things we intended, so this time we had to go only with some basic exercise books, pens, pencils and some sweets, all that was available in the local shops on the island. We visited the very little ones, 5-6 year old pupils, who had just started their school journey and were in the first class. Overall, we did not manage to make that much impact if we compare what we did in Bangladesh and it’s mainly because of limited resources on the island and irregular flights (none) to the mainland. As one lesson learned, next time we will try to bring some first aid needs with us if possible. We have to plan and bring our own power generator with us to Annobon. The only local 2kW generator we could find was in very poor condition and could not supply our stations with necessary power. During nighttime, when power was supplied through grid, it frequently was unstable and with fluctuations, which caused technical problems for our equipment. In addition, again I am very satisfied with SPE Expert 1.3K-FA power amplifier performance, even with grid fluctuations from 100 – 240V it provided very stable output. This PA proved itself in our previous expeditions and it defiantly is on top of my list. Instead of 4 weeks expedition it turned out for 6 weeks. I find this expedition to be successful and I am satisfied with the results given the conditions we had. 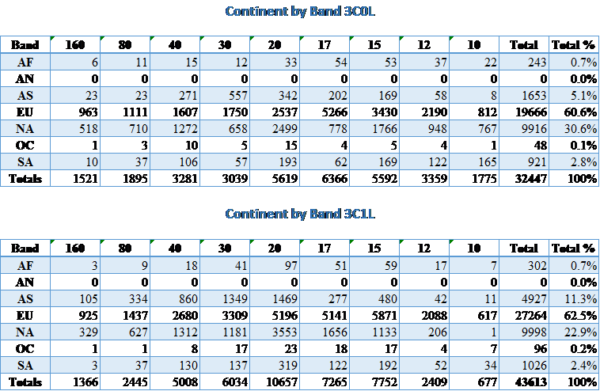 In total we made around 76000 QSOs. We gained great experience and we learned new things for future expeditions. With this article I conclude 3C0L/3C1L expedition and I thank all our expedition supporters. I also would like to thank our friends who supported our team: Eduard, Alida and our home support team. In addition, I have some good news for those who did not manage to work us this time! We are planning to conduct one more expedition to Equatorial Guinea already this month, February 2018. More information coming soon on new expedition website and as usual in email. I wanted to give you as much as possible information and details in this article, and that is the main reason why we could not publish this sooner. Please be understanding about this. Thank you for reading and see you on bands soon!